A large outbreak (or epidemic) of measles has hit over 700 people in Wales over the past few weeks according to NHS Wales. And since there are 6000 children who are unvaccinated against measles in this area, the outbreak will continue to increase in size, since measles is a highly contagious disease. This type of epidemic should not be happening in a modern, advanced country like the UK. Well, who or what is to blame for ? Well, according to a UK newspaper, The Telegraph, “what actually caused the drop in vaccination uptake which led to Swansea was the autism scare, started and repeatedly stoked by Wakefield, abetted (it must be admitted) by the media.” Yes, that Mr. Andy Wakefield whose fraudulent paper alleging a connection between MMR and autism which was retracted by the Lancet, is at fault here. In the wake of further media distortion, misrepresentation, and ignorance in relation to the measles outbreak in Wales, it is important to clarify some key facts. In 1998, following an analysis of all published pre-licensing studies of MMR vaccine safety I recommended the use of single measles vaccine in preference to MMR. This remains my position. At that time, in contrast with the false assertions of many commentators, including Richard Horton, Editor of the Lancet, and vaccine millionaire Paul Offit, the single vaccines were licensed in the UK and freely available to the British public. Six months later, in September 1998, the British Government withdrew the importation license for the single vaccines, effectively blocking this option for parents. Measles cases in the UK rose when the government withdrew the importation license for the single measles vaccine leaving concerned parents with no choice. When I demanded to know why, if the government’s principal concern was to protect children from measles, it would prevent parents with genuine safety concerns over MMR from protecting their children, Elizabeth Miller of the Health Protection Agency responded, “…if we allowed parents the choice of single measles vaccines it would destroy our MMR program.”The government’s concern appeared to be to protect the MMR program over and above the protection of children. 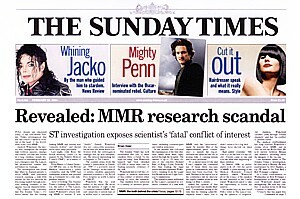 Despite the claim of David Salisbury, head of the UK’s Immunization Division, that MMR has, “an exemplary safety record,” two of the three brands introduced in 1988 had to be withdrawn for safety reasons – they caused meningitis. Government officials had approved these dangerous vaccines – Pluserix and Immravax – giving them the great majority of the UK market despite knowing that they were high risk and despite having been warned explicitly of their dangers. These government officials put price before children’s health and have been seeking to cover up this shameful fact ever since. The US government has paid out millions of dollars to children whose autism followed vaccine-induced brain damage. A recent government concession in the US Vaccine Court confirms that the parents’ claims were valid all along. The cases follows similar successful petitions in the Italian and US courts (including Hannah Poling, Bailey Banks, Misty Hyatt, Kienan Freeman, Valentio Bocca, and Julia Grimes) in which the governments conceded or the court ruled that vaccines had caused brain injury. In turn, this injury led to an ASD diagnosis. MMR vaccine was the common denominator in these cases. Before I criticize his statement for outright lies and misinformation, notice that not once, never, does Wakefield mention any type of empathy towards the children who have fallen ill to measles. Not one comment. How callous is this man? Only sociopaths have such disregard for human suffering. There is no scientific or medical controversy about this conclusion that MMR has nothing to do with autism. Well constructed epidemiological studies also showed no link between MMR vaccine and autism in Denmark, England, Japan, Japan, Poland, and the United States. The MMR vaccine is superior to single vaccines (for which Wakefield had coincidentally sought to patent, as part of his potential economic gain from harming the reputation of the MMR vaccine). Two other MMR vaccines, Pluserix and Immravax, were withdrawn because they may have had higher risks compared to current MMR vaccines. That’s good science and does not have any relevance to the drop in vaccination rates, since they were off the market prior to Wakefield publishing his fraudulent research in the Lancet. The Italian case mentioned by Wakefield is a laughable decision by a provincial court that disregarded all scientific evidence. The other cases in the US Vaccine Court, most of the decisions were ruled without proof of causation, and were simply conceded by the defendants. According to head of the vaccine court, “The overall weight of the evidence (of a link between autism and MMR) is overwhelmingly contrary to the petitioners’ causation theories.” Wakefield has to depend upon massively weak court cases in a pathetic attempt to balance out the incredible weight of peer-reviewed studies. And I won’t even go into the biased reporting of one UK newspaper, The Independent, that is using false-balanced reporting to support Andy Wakefield’s vile attempt to shift the blame to the UK government, rather than his fraudulent paper in the Lancet, as the cause of this measles epidemic. Madsen KM, Hviid A, Vestergaard M, Schendel D, Wohlfahrt J, Thorsen P, Olsen J, Melbye M. A population-based study of measles, mumps, and rubella vaccination and autism. N Engl J Med. 2002 Nov 7;347(19):1477-82. PubMed PMID: 12421889. Mrozek-Budzyn D, Kiełtyka A, Majewska R. Lack of association between measles-mumps-rubella vaccination and autism in children: a case-control study. Pediatr Infect Dis J. 2010 May;29(5):397-400. doi: 10.1097/INF.0b013e3181c40a8a. PubMed PMID: 19952979. Taylor B, Lingam R, Simmons A, Stowe J, Miller E, Andrews N. Autism and MMR vaccination in North London; no causal relationship.Mol Psychiatry. 2002;7 Suppl 2:S7-8. PubMed PMID: 12142932. Uno Y, Uchiyama T, Kurosawa M, Aleksic B, Ozaki N. The combined measles, mumps, and rubella vaccines and the total number of vaccines are not associated with development of autism spectrum disorder: the first case-control study in Asia. Vaccine. 2012 Jun 13;30(28):4292-8. doi: 10.1016/j.vaccine.2012.01.093. Epub 2012 Apr 20. PubMed PMID: 22521285.